£40 UK ONLY orders; includes p/p. REST OF WORLD orders: please email: birdart@ericpeake.co.uk for payment details & shipping costs. Artist Signed & Numbered Limited Edition Print of St. Vincent Amazons. Overall size: 24" x 17". £30 UK ONLY orders; includes p/p. 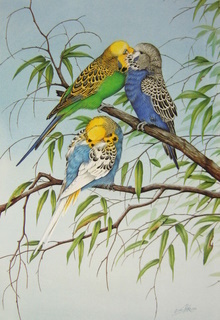 Artist Signed & Numbered Limited Edition Print of a trio of Budgerigars. Size: 22" x 13 3/4". 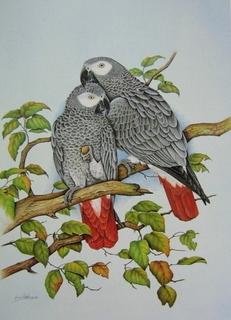 Artist Signed & Numbered Limited Edition Print of African Grey Parrots. ALMOST SOLD OUT! 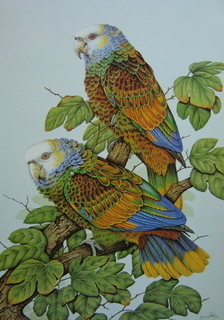 Artist Signed & Numbered Limited Edition Print of Hawk-headed Parrots. Size: 22 1/2" x 15 1/2". £35 UK ONLY orders; includes p/p. 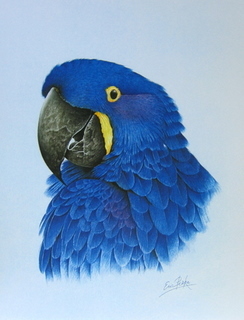 Artist Signed & Numbered Limited Edition Print of a Hyacinth Macaw. ALMOST SOLD OUT! REST OF WORLD orders; please email: birdart@ericpeake.co.uk for payment details & shipping costs. 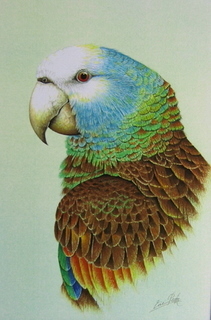 Artist Signed & Numbered Limited Edition Print of a Major Mitchell's Cockatoo. ALMOST SOLD OUT! 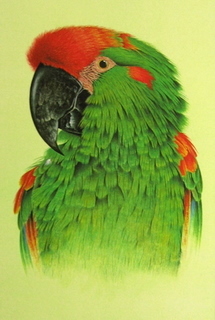 Artist Signed & Numbered Limited Edition Print of a Red-fronted Macaw. Regular Edition: 50. £55 UK ONLY orders; includes p/p. 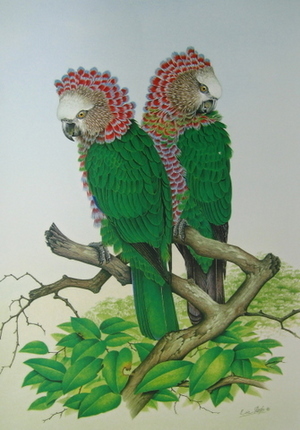 Artist Signed & Numbered Limted Edition Print of Scarlet Macaws. Image size: 29" x 21". 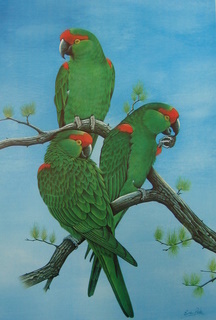 Artist Signed & Numbered Limited Edition Print of Thickbill Parrots. ALMOST SOLD OUT!